Linkwood Studios has a Kickstarter campaign up and running for Talaiden Tactics, their new fantasy board game for 1-5 players. 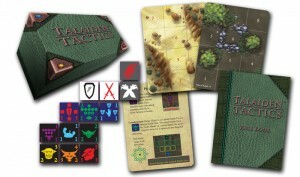 Talaiden Tactics, an exciting card and dice strategy game, lets you and up to three other players become brave adventurers exploring the dangerous world of Talaiden. Players cooperate against monsters across the varied terrain of Talaiden. One player may even choose to control the monsters, making Talaiden Tactics playable by up to five. The goal of the game is simple; your Heroes must survive a journey through harsh wilderness while carving a name for themselves throughout Talaiden. However, if no surviving Hero is left to move to the end of the Landscape Setup, the Dark Forces will triumph… Survival is never guaranteed… Ready your Heroes to vanquish the Dark Forces that plague Talaiden! Glory and honor are yours to be had!